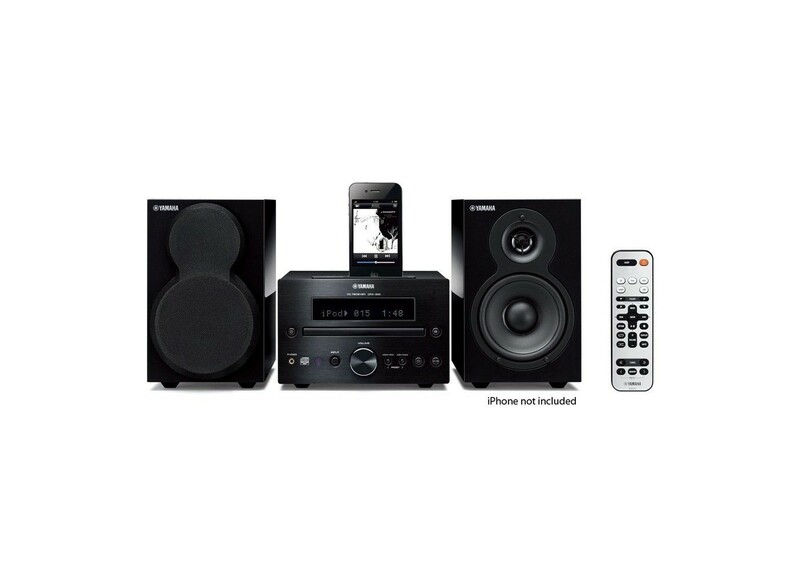 The MCR-332 is an executive style mini-system featuring iPhone, iPod and iPad compatibility among other advanced features bundled with a pair of elegant piano black finish speakers. The foundation of the MCR-332’s excellent audio performance is a Yamaha-developed digital amp that provides smooth, unforced sound output. The receiver’s separate digital and analog low-noise circuitry ensures thoroughly high sound quality, which is delivered by new-design speakers. A USB terminal on the top of the unit makes it quick and easy to plug in an iPad or other USB device. The digital connection permits fast, loss-free signal transmission. The iPhone/iPod dedicated dock provides a digital connection, which means that the digital signal from the iPhone/iPod is transmitted directly to the receiver. This minimizes noise interference and allows use of the MCR-332 DAC, rather than the /iPhone/iPod DAC, resulting in more precise sound reproduction. Drawing on decades of experience creating fine pianos, Yamaha gives its speakers a beautiful piano-like finish that looks elegant in any setting. The speaker grilles are also designed for good looks, but can be removed for a more basic appearance. The 2-way bass reflex speakers use new-design 4-3/8” woofer units, have deep cabinets and are supported by three legs that prevent external vibrations from affecting the sound. The result is powerfully resonant bass and rich mid-range and treble, so you enjoy high sound quality with good imaging. Ensures that the Speakers Accurately Reproduce the Sound from the Main Unit Speaker cabinets vibrate, degrading sound quality. To overcome this, Yamaha drew upon its musical instrument manufacturing expertise to develop an internal structure called VCCS (Vibration Control Cabinet Structure), which uses strategically placed pieces of a composite material that provides excellent vibration isolation performance. Both receiver and speakers use these large terminals to ensure high quality, reliable connection. New Style Remote Control The remote control has a simplified design that makes it extremely easy to use. Dimensions (W x H x D) 7-1/8" × 4-5/8" × 12-1/2"
Complete Package Dimensions (WxHxD) 20-3/4" x 15-3/4" x 11-1/2"
Shipping Weight (lbs.) 23 lbs.